The automated subsystems in SIMP keep your systems consistent and protected. Fully manage the distribution of key materials throughout your environment and be assured that SIMP services are seamlessly protected. Centralized account management provides effective real-time administration of users. System-level network protection and logging across all managed systems. All exposed services running on the system have an enforced firewall policy. Encrypt and authenticate remote system communications. Privileged user access restriction and enforced access control groups help detect insider threats and prevent unauthorized access. Audit privileged and invalid user activity by actively collecting critical security events across the managed infrastructure. Authorize the services that you want to run either system wide or selectively by host. Disable and report on services that have been enabled without authorization. Our team of security and automation experts have worked together to design and develop SIMP. We've incorporated the industry-specific considerations needed for regulatory compliance, planning management, and reporting. If there is a box, we check it. For a list of capabilities related to your industry, please download the informational brochure. With a +SUPPORT subscription, you can enjoy the flexibility and community participation of an open source project with the benefits of supported software. As a +SUPPORT subscriber, you will have access to security plan templates, a private support portal, and SIMP updates. Contact us today to become a SIMP +SUPPORT subscriber. "Federal departments and agencies shall ensure that all existing privacy principles policies and procedures are implemented consistent with applicable law and policy and shall include senior agency officials for privacy in their efforts to govern and oversee information sharing properly." "Employing effective risk-based processes procedures and technologies will help ensure that all federal information systems and organizations have the necessary resilience to support ongoing Federal responsibilities critical infrastructure applications and continuity of government." "Puppet is the preferred solution among federal agencies and contractors looking to manage their IT infrastructure with utmost agility efficiency and insight and to automatically monitor changes against baselines to enforce security policy. Maintain your desired state as you have defined it." "The organization employs automated mechanisms to respond to unauthorized changes. " You asked and we've answered. If there is anything you need to know to decide whether SIMP is the right compliance framework for your environment please contact us for more information. How do I add SIMP to my Environment? The easiest method for trying SIMP is to grab an ISO! Alternatively, the SIMP Quick Start Documentation contains everything you need to get started with a SIMP installation. How do I build a new Infrastructure with SIMP? 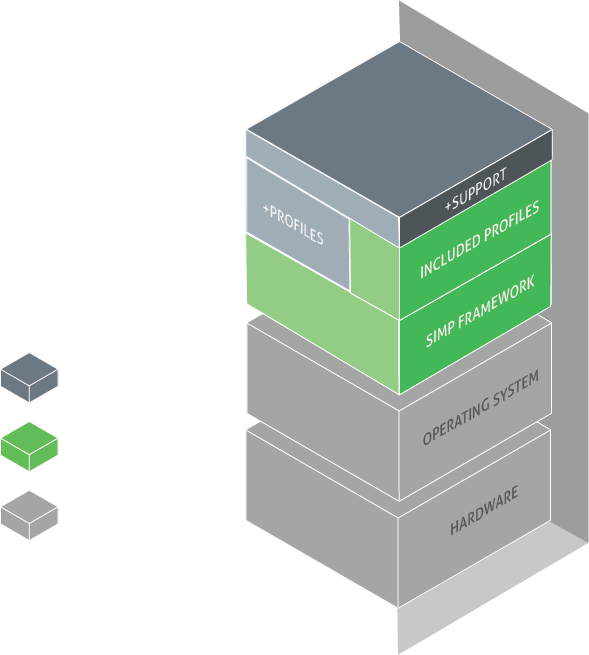 Our preferred methodology; building new infrastructures with SIMP ensures that you start out with a minimized package load and reasonable partition defaults from the beginning. To get started, grab an ISO and then proceed to the relevant user documentation. Can I Use SIMP In My Environment? If you are working on a supported version of Red Hat Enterprise Linux or CentOS based environment then SIMP will work in your existing infrastructure. Onyx Point provides commercially available SIMP modules for Microsoft Windows. Is SIMP Really Open Source? The SIMP product is Open Source under the Apache 2 license. We encourage and accept contributions to the project from our community on GitHub. If you would like to make contributions in any way we are happy to have you! Please see the Contributors Guide for full details and don't hesitate to ask for help if you need it! Can I Use My Existing Puppet Modules With SIMP? SIMP is compatible with any Puppet modules that do not have namespace conflicts with the core SIMP modules. We heartily encourage the use of the Puppet Forge for enriching the functionality of the SIMP framework. Does SIMP work with Puppet Enterprise? Contact us for more information regarding PE integration. Puppet was chosen due to its nature as a declarative language suited to enforcing security settings as part of a comprehensive configuration run. Over time, Puppet has proven to be a successful language for ease of use by administrators, developers, and security personnel alike. Do I have to use Puppet? SIMP uses Puppet as part of its core infrastructure. However, you can compliment the SIMP framework with any automation solution that suits your environment. Be aware that you will need to check the Documentation to ensure that you do not run into operational conflicts. As always, be sure to test carefully! How Can I Get SIMP Support ? SIMP Support is available through Onyx Point Inc.
As core developers for SIMP, Onyx Point offers installation integration, custom module development, and maintenance plans. Contact us for more information. Whether you are chief of an organization, a systems administrator, or a developer, we have the tools you need to start on the path to a secure and compliant IT environment. With a secure framework in place and SIMP covering the essentials, you can shift focus to your immediate and long-term business goals. We're glad you are here and look forward to bringing SIMP to your environment. Connect with us in our SIMP Slack Workspace. No login is required, but it will allow us to answer your questions once you're offline. If you have an article you would like to send our way, please drop us a line! Connect with the SIMP community on our Google Groups Q&A Board or one of our other mailing lists. No question is too small! That said, this is a community forum and commercial support and training is available from Onyx Point, Inc. for those Enterprise grade questions. Feedback via our JIRA Bug Tracker is always appreciated! Our JIRA instance has been graciously donated to us by the fine folks at Atlassian Software as part of their support of Open Source projects. Want to Hear The Latest SIMP News? We'll never SPAM you, we promise. As an Open Source project, we focus our efforts on the product and the community it supports. If you want to know when Windows will be supported, what the latest release includes, what community contributions we've pushed downstream, etc. then sign up for our periodic news releases. Drop us a line using the form below to get a response from our team.